As you may remember, in my last post I showed a transformation that involved removing my client’s pool and replacing it with a beautiful and functional garden. Today I’ll show you an entirely different scenario where the pool is actually a cherished part of the ‘garden’ (I use that term loosely – you’ll see why in a minute), requiring us to create various spaces throughout that would enhance the family’s enjoyment. When I first met the homeowner (a talented artist, and mother of two teenage boys), she was filled with distress and distrust. After spending a ton of money with a dishonest contractor, she was left with a garden (I use this term loosely) filled with very costly and very dead plants, a terrible irrigation system, and a giant, half-dead lawn. Tired of getting the run around from this person, she wrote her garden off as a total loss, stared at this mess for over a year, and eventually thought she’d give it one more try. Over the years, I’ve met several frustrated people who at one point had trusted someone with their garden only to end up spending way too much money for really shoddy work. Unfortunately, it happens. Can you imagine? Spending your hard-earned money only to be left with the below pics? After reassuring her that she wasn’t to blame, she began to gain a little more trust. A few meetings later, she began to feel confident, and even excited, that we could move forward and create something that would fill her with joy, instead of dread. Her wish-list for the new garden included one that would lure her boys outside and away from the TV, provide year-round flowers for her to study and paint, use less water, and add a secluded courtyard oasis. Since the back garden is so much more extensive and is where the family spends the bulk of their time, we needed the front garden to be very low-maintenance and look good year-round. We began the front re-design by first removing the entire front lawn and replacing it with layers of low-water plants such as westringea, rosemary, grevillea, phormium, and lomandra grasses. While the emphasis was on foliage, we, of course, had to include some colorful flowers. But to reduce the maintenance, we made sure they were long-lasting with weeks and weeks of blooms. Included are the ‘Amber’ Flower Carpet Rose and ‘Sykes Dwarf’ Oakleaf Hydrangea (both below), grevillea ‘Scarlet Sprite’, and nepeta (Catmint). Also nestled in the main front bed is a beautiful olive jar, which ties into the home’s Mediterranean style. Next, we laid a simple pathway of loose-set flagstone that leads to the side of the garden, passing through a gate with ‘Iceberg’ roses scrambling up and over it. We added fast-growing dymondia ground cover between the stones to soften the stone’s edges and to help them blend in with the surrounding garden beds. Now on to the back! As I mentioned earlier, this pool is cherished by the family and their two teenage boys. It’s definitely here to stay, as it’s a focal point of the garden. So, to make the pool more enjoyable, we added a loose-set flagstone patio for the lounges and umbrellas. Similar to the front pathway, the dymondia groundcover softens the stones. We then reduced and leveled the lawn, adding a few steps flanked by a simple retaining wall of stacked Sonoma fieldstones. We also planted a mix of succulents within the stone walls that add more color as they softly spill over the sides. Surrounding the smaller lawn are lush garden beds, as well as a small gathering area hidden from view, for the boys and their friends to hang out. The homeowner wanted a very full, overflowing garden filled with textural and colorful plants that she could use as inspiration for one of her main passions – painting. I focused on tough, low-water shrubs for year-round interest, providing loads of colorful flowers (even in winter, with cool-weather flowers and unusual seedpods), textural foliage, and interesting shapes and forms. Favorites include grevillea (‘Peaches and Cream’), melianthus (with its oversized and textural foliage), westringea (rarely if ever needs pruning and flowers off and on the entire year), phormium, phlomis russeliana (note the dried winter seedpods in the photo), feijoa sellowiana (delicious edible guavas), and loads of grasses. The hot tub is located near the pool but is almost completely hidden from sight thanks to oversized tropical foliage, such as this enormous philodendron, banana plant, ‘Icee Blue’ podocarpus, and a front border of colorful lantana. Behind the hot tub area, also hidden from view, is a narrow and winding pathway that leads to a private courtyard just outside my client’s bedroom. This is an area she wanted to create that would be for her and her husband – a sanctuary where they can sit in the sun and relax. She wanted this courtyard to feel overgrown and a bit wild. To achieve that, we included tall and airy plants, such as grevillea ‘Long John’ (now a favorite of hers as she can watch hummingbird antics from her bedroom window), orange-flowered Lion’s Tail, phormium, rosemary, phlomis, and lavender. It’s been two years now since planting the garden. A garden that not only draws her boys outside more than ever before but is also a source of endless inspiration for her incredible paintings. Every time I visit, there’s new proof hanging on her walls that clearly show the love she has of her new garden. It makes my heart sing! If you’re in the area, I hope to see you there! If not, stay warm and pray for spring! Welcome to Seattle! I enjoyed your talk yesterday at the Seattle Garden Festival. I sat through many …. and yours was by far one of the best! Thank you for coming this year … hope it becomes an annual event for you! Your talent knows no bounds! I am happy for your client, that she can now enjoy her yard. I imagine it irritated her to have wasted the money and the garden views for so long. I love her artwork too. I love everything about this garden! Beautiful job! Can you tell me what the large leaved blue gray shrub is in pic beside the grevillea peaches and cream? Hi Desiree – Thank you for the kind words! I believe you’re referring to the Melianthus ‘Antonow Blue’ (the huge-leafed shrub, very textural leaves?) It’s a beauty – a big one, too. There’s a smaller variety out there called ‘Purple Haze’ that grows to about 4×4 – worth the hunt! What a beautiful garden! Lucky them, they now have a whole new expanded living area. I would be hard-pressed to decide where in the garden to sit and relax! Their “yard” is now a lovely and very inviting garden. Thank you, Vivian. I didn’t even show half of the seating areas that were there before I came along – it certainly is an entertainers paradise. I hope you’re doing well – did you get snow? We did this morning – I just about DIED. Snow all over my new little citrus trees!!! Great job Rebecca! So glad she had you with her for this journey. Everyone deserves a beautiful and uplifting garden and not be taken advantage of! I see this happen to people as well. Take care. Thanks for all the inspiration! That’s a fantastic transformation. I love it. There are so many plants – did you use smaller plants to keep the cost down? If you did, they clearly are very happy there. There is such a sense of journeys to be taken by following the lovely paths. Thanks so much, Barbara, I’m glad you enjoyed it! 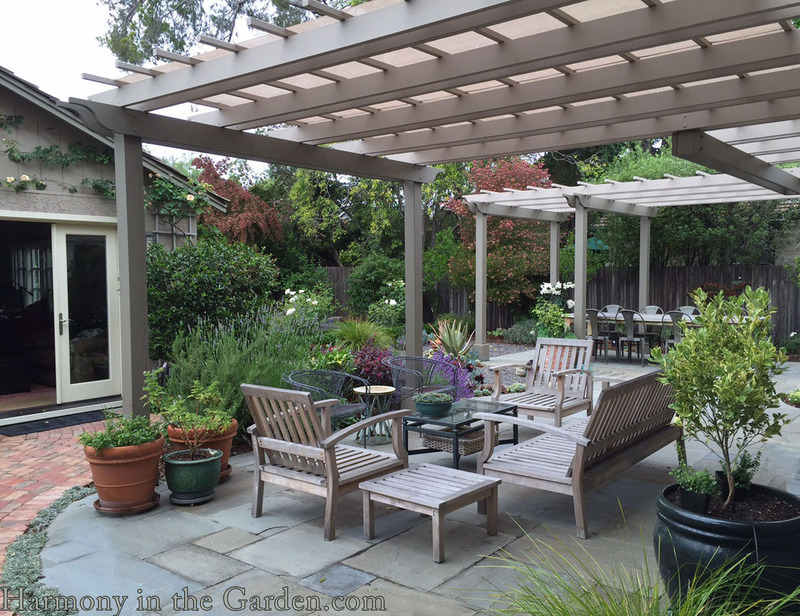 We used a combination of small and larger plants – she was just so tired of looking at a half-dead garden that she wanted some areas to really look established as soon as possible. It does help that the plants love their new garden, though. They’ve grown really fast!